Sara Rose Greene is as bright as any other child her age- yet her muscles do not work like a normal persons, due to the disease Spinal Muscular Atrophy. 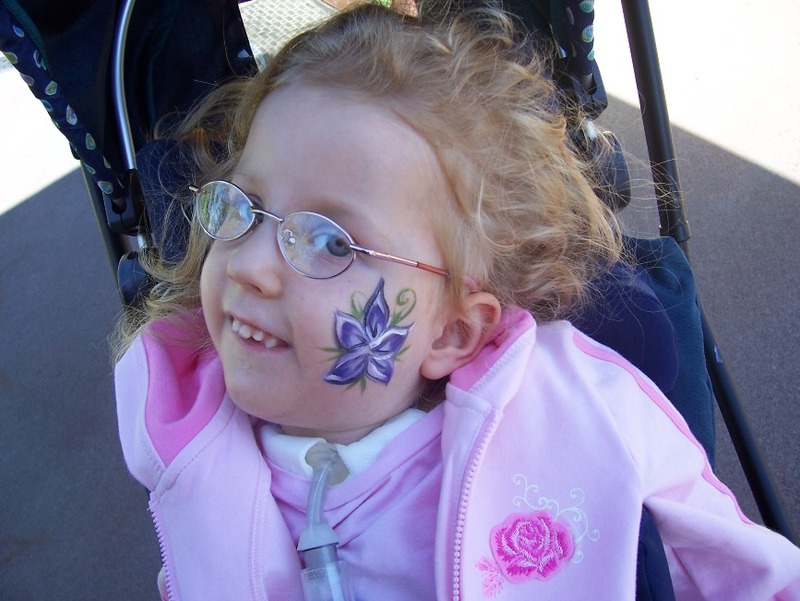 Sara has the most severe form of the disease which is type 1-Werdnig Hoffman Disease. Due to her muscle weakness Sara is assisted with breathing via a pressure ventilator and fed with a g-tube. She has many other kinds of equipment we use to help her get along with life the best we can. We hope to share some of our ideas and equipment through pictures for other families w/ SMA. Her big sister, Laura, is also a great help! To live with SMA is quite a challenge. Every time mom hears someone cough or sneeze another grey hair pops out of her head. You see, most colds turn into pneumonia for Sara. Pneumonia and atelectasis seem to come with most colds and that is very scary, serious, and uncomfortable for Sara. We sure do get to exercise our prayer skills a lot with SMA around here- which is in southern California. Sara's first pneumonia was when she was 7 months old. It put her into the hospital for three months. When we came home Sara had a trach and a vent. We just couldn't get her extubated to a bi-pap correctly- long drama story. Since then, Sara has had only one more pneumonia hospital stay- which was Thanksgiving week of 2005. We are at our third children's hospital for pulmonary and ENT doc's. We started at Loma Linda with the first pneumonia and transferred while Sara was intubated to CHLA - Children's Hospital Los Angeles. We came home from CHLA and did a bunch of follow up visit there until mom had it with LA traffic! Now we see pulmonologist, Dr. Park, at the San Diego Children's Hospital. He has a satellite office in Murrietta 20 minutes from home- yeah!! Now we do a lot of Zoo trips too. Loma Linda was the worst Children's Hospital. They would close the door during rounds so parents could not hear their discussion and they would make parents leave their child for a full hour each morning and evening during RN shift change. Totally unacceptable in my eyes when my child is in intensive care!!!!!!!!!!! The other hospitals are not like LLUMC. Sara has done much traveling for a little girl her age and a disability like hers. Sara has been to Salt Lake City, Utah for clinical trial visits a few times. On our road trips, Grandpa Ron drives the motor home while the rest of the gang gets to hang out in the back. Salt Lake City trips usually include some scenic side tours such as Bryce Canyon. We even took off to Oregon for a Thanksgiving trip last year. We have made it to Montana twice to see Uncle Buck and Aunt Monica. Our last trip to Montana was with Dad's Road King and Grandpa's ultra glide to attend the Harley Davidson Wild West Rally. At the rally Sara got to see hundreds of bikers, hear the roar of the bikes, meet some MDA kids, and enter backstage for handicap parking while Credence Clearwater Revival performed on stage. Sara has been to the LA Zoo, San Diego Zoo, San Diego Wild Animal Park, Sea World, on carousal rides at the mall, and many other places. This September we have plans for Disneyland for Sara's 4th Birthday! Walk N Roll to Benefit FSMA - Click Here for More Information!